After a month or so of limited social media interaction, I’m back! But, things have changed. Just over a year and a half ago, my mom passed away. Just over two months ago, my brother lost his battle with cancer. And on a happier note, this month marks my little man’s 2nd birthday. Circumstances have given me pause to think, and what I came up with was that I needed to do some of those projects I’ve been putting off. You know the ones. The ones that you’ll do when you have time. Well, time is precious, and we don’t always have as much as we think we do. It is time to buck up and get it done. For the past month and a bit, I’ve been working on a new children’s book. The first one where I’ve done both the writing and illustrating, and now I’m at a point where I’m ready to get some feedback. Make sure it reads well. Make sure the flow is there…and that kids will enjoy it. 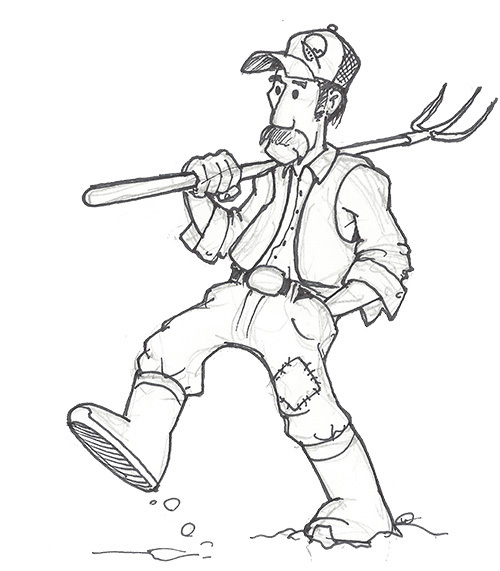 I don’t want to share too much about the story yet, but today’s image was one of the early sketches of a farmer that appears in the book. Hopefully there will be much more to follow!